I thought it might be really fun to make a jersey version of the Banksia too! What i’m aiming for is something a lot like this top from my last apparel collection. 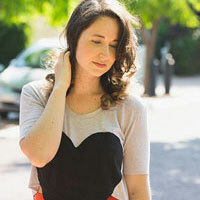 It’s honestly one of my wardrobe staples – something i love throwing on for a combo of comfort and cute. 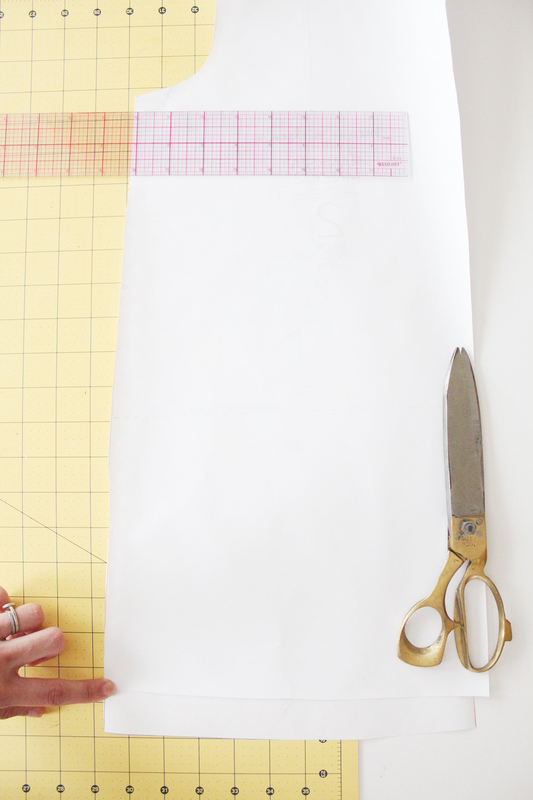 Want to learn how to alter the pattern for stretch?? Lets go! 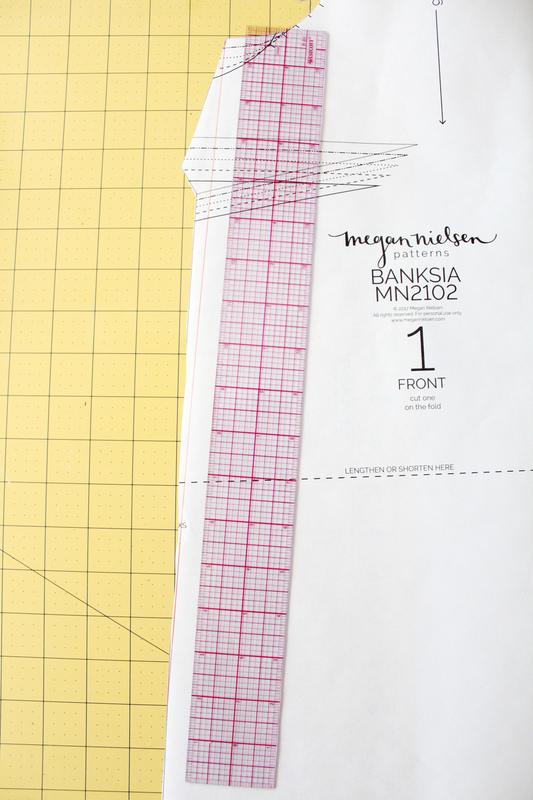 The first thing to note is that this is not a normal alteration for turning a woven pattern into a stretch pattern. 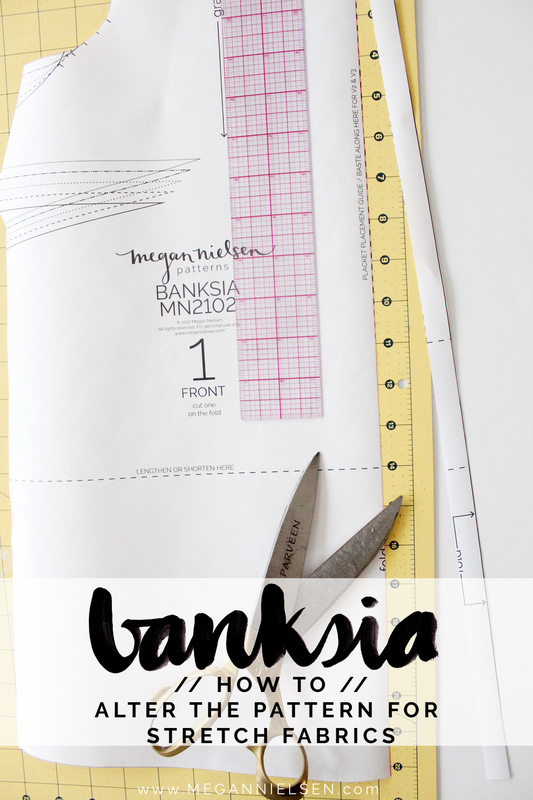 This is a method i’ve developed just for the Banksia pattern, where we will be making alterations to just the front pattern piece in an attempt to make your life easier. 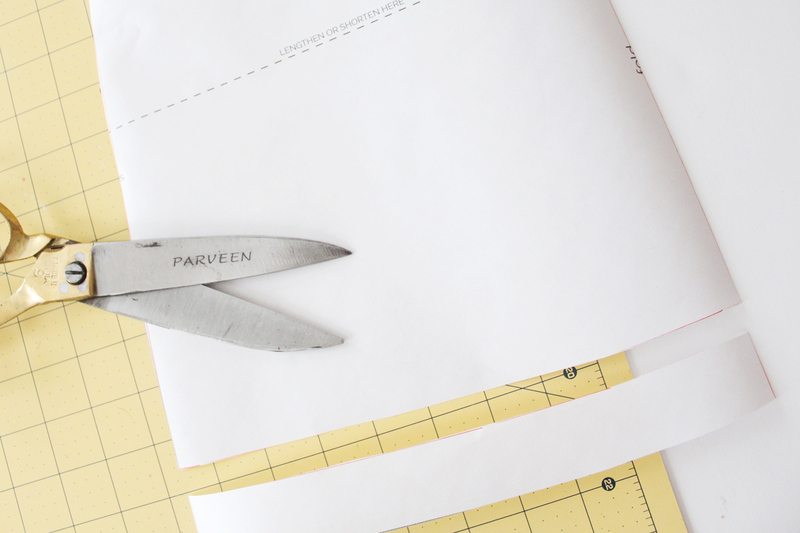 The first thing we’re going to do is draw a line along the placket basting guidelines that extends all the way to the bottom of the pattern. 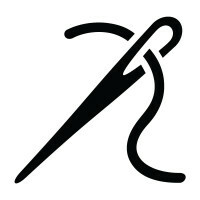 Then cut off that piece. This will be your new center front, cut on fold, line. The reason we’re doing this is to not only reduce the ease in the pattern, but also to bring the collar to the centre front, eliminating the placket, and also meaning that you won’t have to alter the collar piece. Draw a straight line from the underarm straight connecting with the side seam. Then cut it off. Now that we’ve removed the dart, the front pattern piece will be longer than the back. We will need to true the side seams. 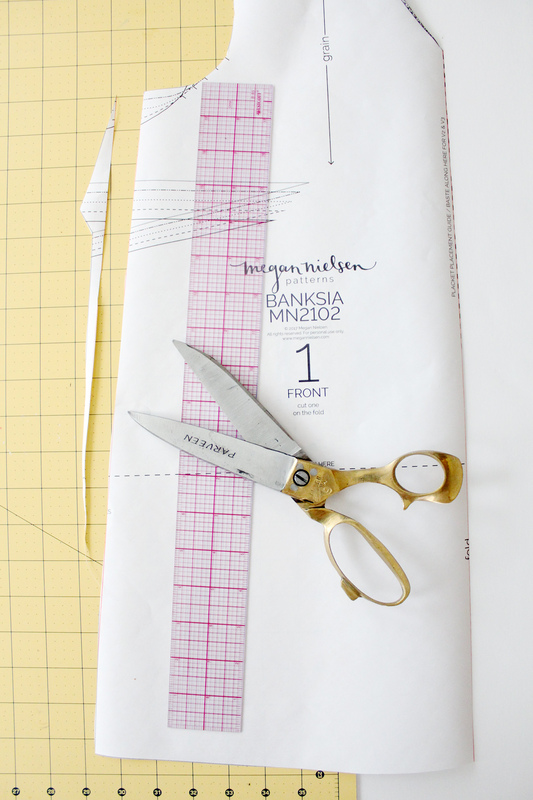 Do this by lining up the under arm of the back and front patterns, and making sure the side seams match up. 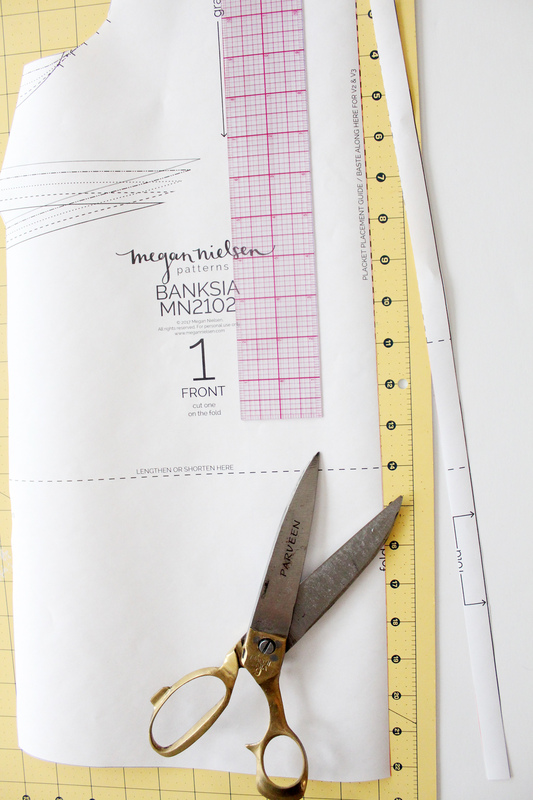 Then draw a line at the hemline so they are the same length, and cut! As we continue with the sewalong i’ll give more specific sewing instructions for sewing this pattern variation. I didn’t want to enter the sewalong as I have 5 banksia already, but a knit version really tempts me… Thank for the tutorial! Ahhhh jersey Banksias would be such great additions for my fall wardrobe! Oh no! Now I need a jersey Banksia, too! This is a great idea! 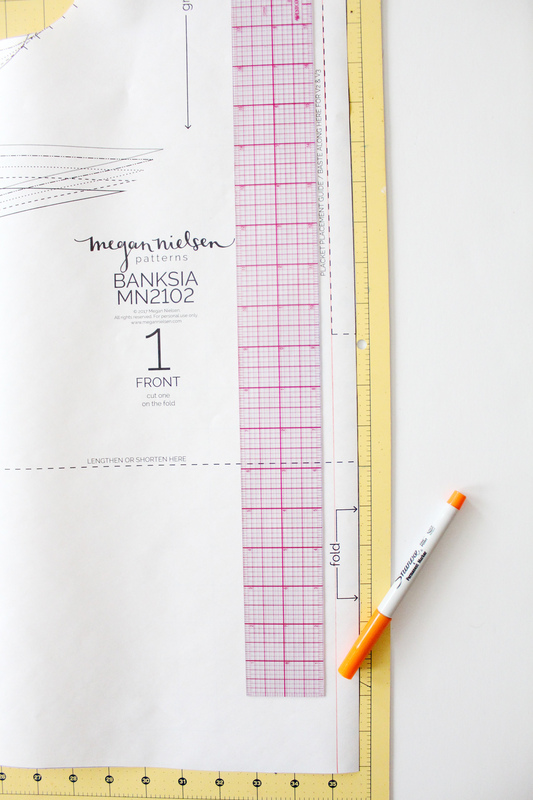 I’ve wondered how to change a pattern to sew with knits instead of wovens… and I bet that the Banksia top would be really cute in a jersey knit type fabric too! Possibly an odd question, but I was wondering if you’d still finish the neckline with bias tape if sewing with knits, or finish it some other way? With no placket I suppose it would be less visible, maybe it could even be left raw, or would it need to be stabilised?